This is a well developed neat filly from a good running family. She is nicely put together with the strong walk that we look for and an intelligent attitude. She is Super VOBIS qualified, entered for the Inglis Race Series, and fully insured. She has gone through the breaking in process and had her first educational preparation in the stables. We will spell her for another 6 weeks or so to give her time to grow and develop, then next time she comes in to work the plan is to take her through to an educational jumpout. HUSSON (ARG) (Chestnut 2003-Stud 2007). 5 wins to 1600m, San Isidro G.P. Raul y Raul E Chevalier, Gr.1. Sire of 332 rnrs, 204 wnrs, 11 SW, inc. Lucky Hussler (MVRC William Reid S., Gr.1), Frolic, Moral Victory, Russon, Sabat Husson, Lady Hussy, Husson Eagle, The Huntress, Affable, Hussousa, Peron, SP Looks Like the Cat, Miss Husson, Sister Souss, Ferment, Hi Son, Private Secretary, Lake Husson, Pay Up Bro, Dane Hussler, Little Miss Smiley, etc. ORPHAN, by Tiger Hill. Unraced. This is her first foal. Secret Relations. 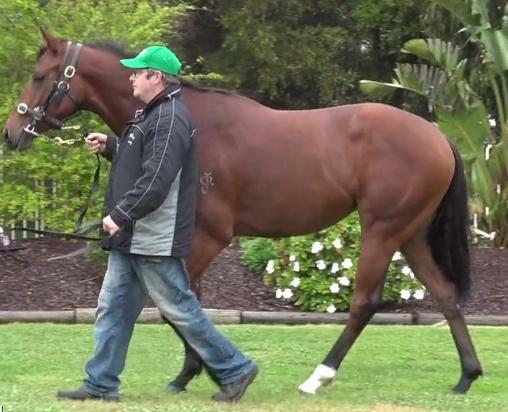 4 wins to 1200m, BTC Lyndhurst Stud H., STC Escape to the Races H., 3d Qld Tatt's RC IPG H.
Campaignor. 8 wins from 1100m to 1600m, A$82,500, 2d STC De Bortoli Wines H.
Port of Hainan. 6 wins at 1200m, 1400m in Malaysia. Nokin. Winner at 1000m in Aust. Monte Agar. Winner at 900m in 2015-16 in Aust. Street Related. 7 wins from 1100m to 1900m, A$85,667, 2d WATC Carlton Dry H.
Friendwithbenefits. 2 wins at 1000m, 1100m to 2015-16 in Aust. Cozumel. Winner at 1000m in 2015-16 in Aust. Adoptme Two. 7 wins from 1350m to 1800m, A$147,475, MVRC Hacer Group National Apprentice Series H., SAJC Boag's Draught H., Members Race Day H., ACG Security H., 3d SAJC Ken Smith AM H., Holdfast Insurance H., Seeley International H., Betfair H.
Adoptme. Winner at 1350m, SAJC Pewsey Vale P., 3d SAJC Mick Dermody Memorial H.
NOT RELATED (Family Ties). 12 wins. See above. Dee'n'gee (Consolidator). 7 wins to 1350m, A$206,740, ATC EF Cooke H., Australian Turf Club H., TAB Sportsbet Sprint H., 2d ATC Tab.com.au H., 3d ATC Carrington S., L, Hawkesbury RC Ladies Day Cup, L, ATC SCSI H., TAB Iphone App H., James McCall Retirement H., 4th ATC Hall Mark S., L.
RIVA DE LAGO (Encosta de Lago). 9 wins to 1400m, A$730,130, to 2015-16, ATC Theo Marks S., Gr.2, SCTC Glasshouse H., L, BRC Cardno H., Scone RC Yarraman Park Horsepower H., ATC Rosehill Gardens H., Kari Aboriginal Resources H., Better Bet With a Bookie H., Vincents Forensic Accounting H., 2d ATC Ajax S., Gr.2, Liverpool City Cup, Gr.3, Scone RC Luskin Star S., L, BRC Hamilton Hotel H., ATC Blackwoods Loctite H., 3d ATC Razor Sharp H., L, City Tattersalls Club H., BRC Salmat H., ATC Brickmakers Creek H., Jacob's Creek Moscato H., 4th ATC Maurice McCarten S., L, Ipswich TC Eye Liner S., L.
Better (Monde Bleu). Placed at 2, 2d WATC Supremacy S., L, Purified Ice H., Irish Knight 2YO H., 3d WATC Bill Barber 2YO H.
OPULENCE, by Shifnal. Winner at 1200m, 3d SAJC Woodlands Graduation S. Dam of 3 foals, 2 to race.